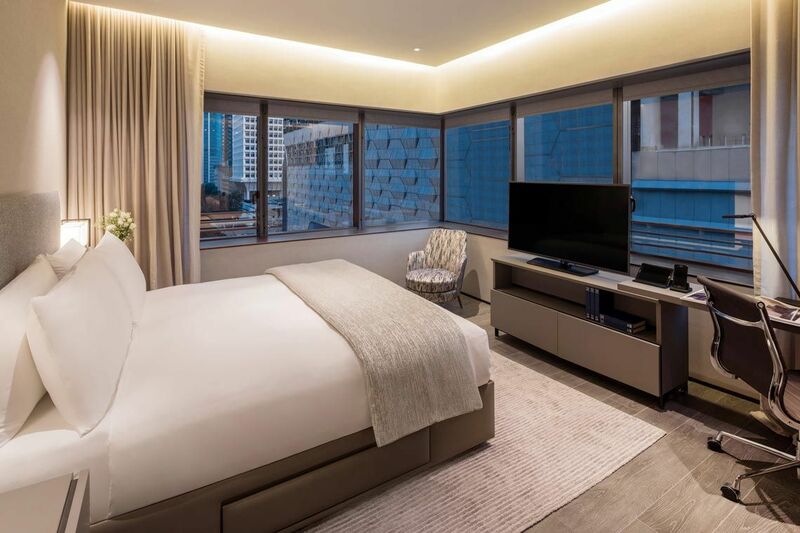 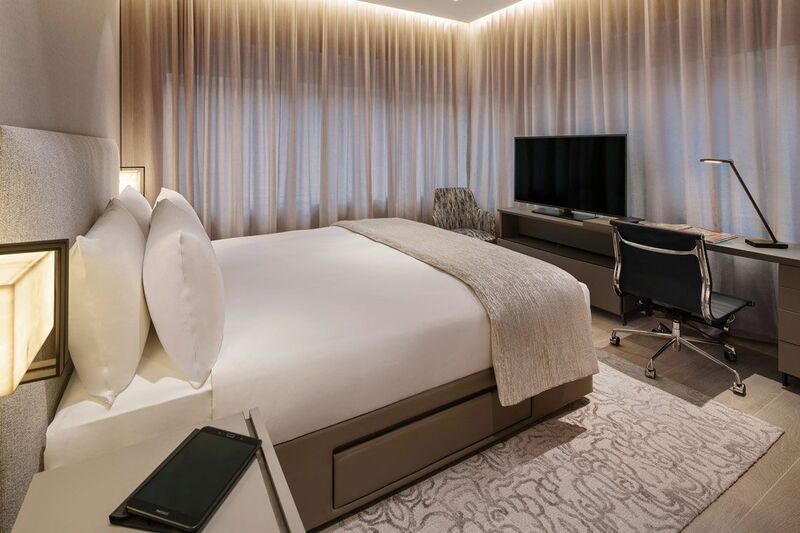 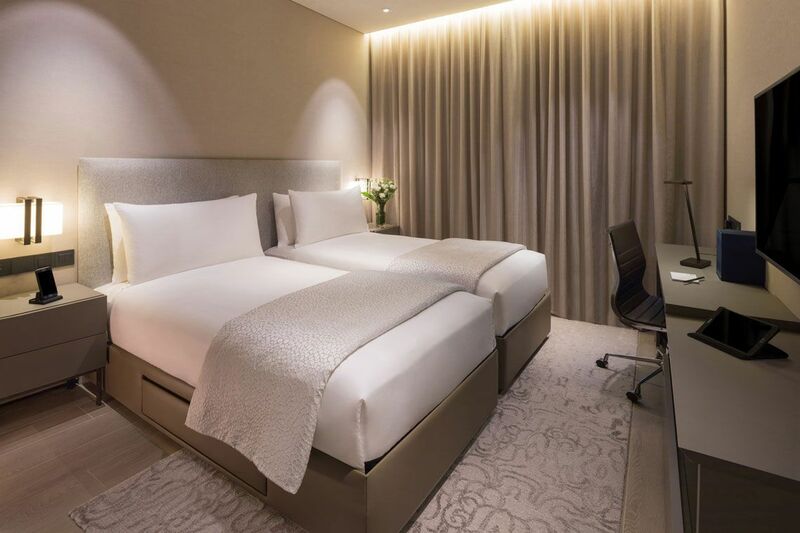 Set in the heart of Singapore’s vibrant Central Business District, Oakwood Premier OUE Singapore is an award-winning luxury hotel and serviced apartment that blends urban sophistication with nature-inspired elements to create an intimate oasis for international travelers. 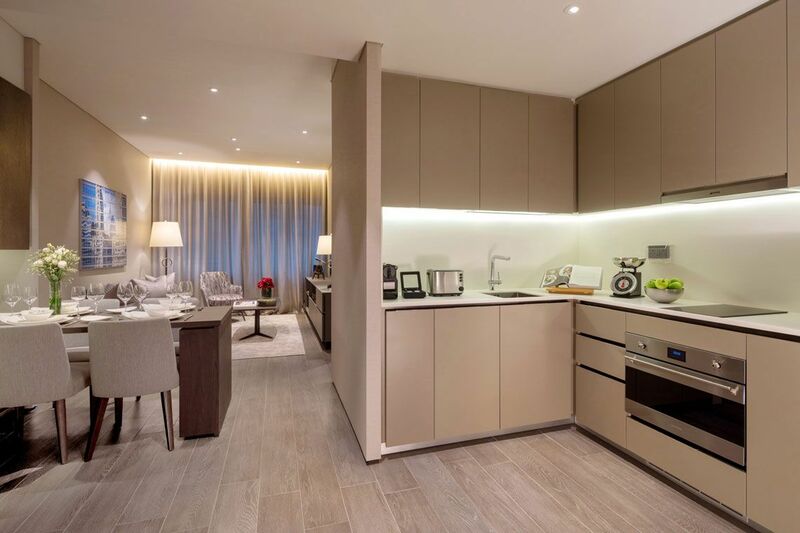 A luxe contemporary setting teamed with a stylish color palette carries through the interiors of all 268 apartments. 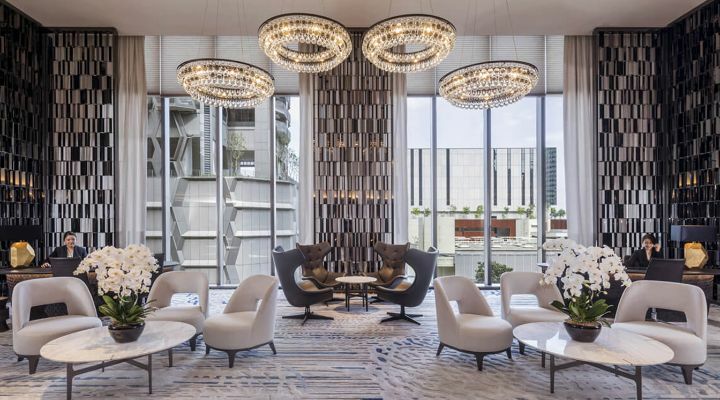 [NOTICE] From now until 7 April 2019, the nearest drop-off point to the property is the taxi stand at OUE Downtown 2 (E19) as the driveway at OUE Downtown 1 is temporarily closed for maintenance. 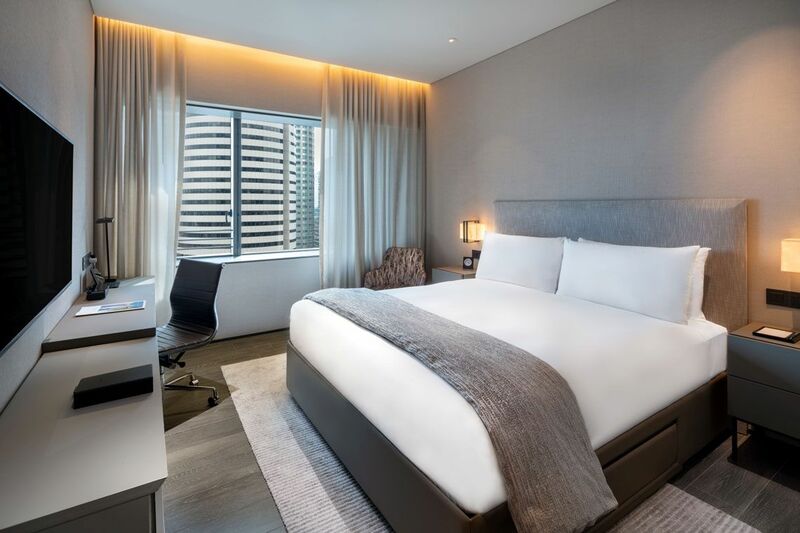 Designed with a chic 21st-century aesthetic, the studio apartments are perfect for work and leisure travelers. 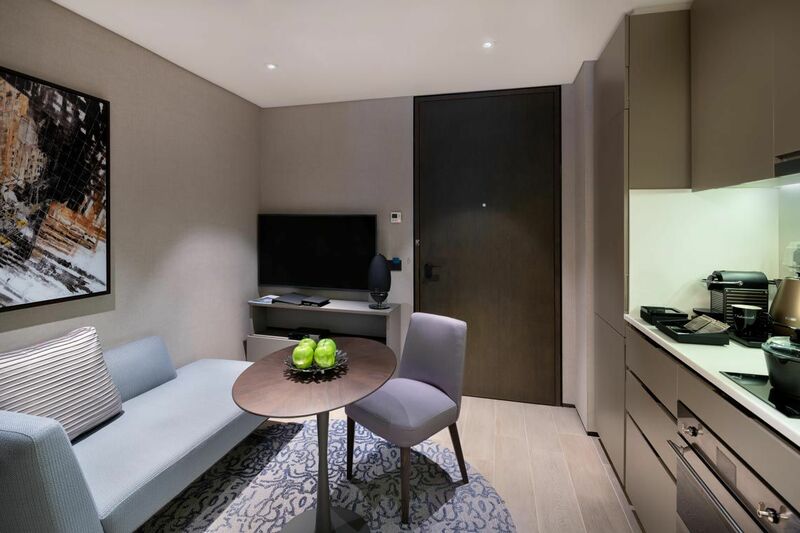 Each unit comes with a kitchenette, rain shower, Bluetooth sound system, as well as a Samsung mobile phone and tablet for guests’ use. 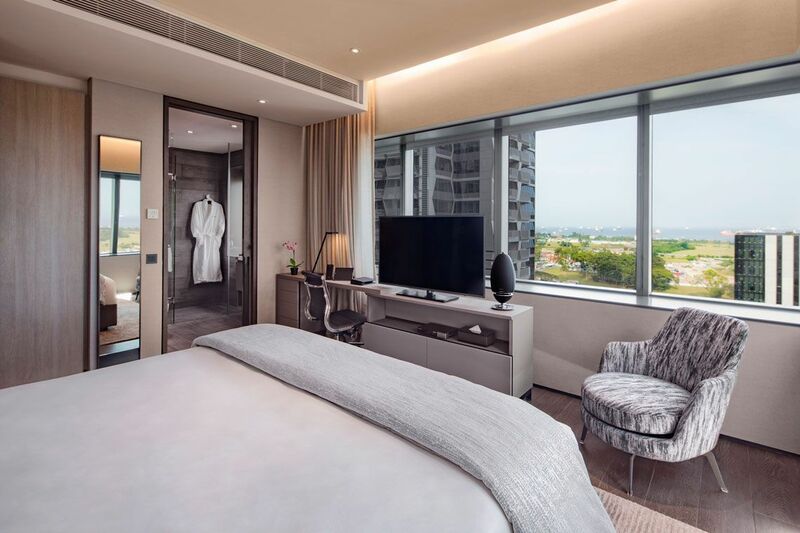 Adding a cosmopolitan elegance to your stay, Oakwood Premier OUE Singapore’s Deluxe one-bedroom apartment sets the benchmark for classy living with its individual master bedroom and separate living area. 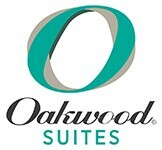 Each unit is beautifully furnished with a fully equipped kitchen and a washer/dryer. 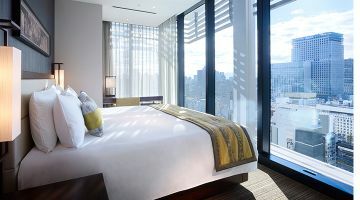 Guests are also free to utilize the accompanying Bluetooth sound system and Samsung mobile and tablet. 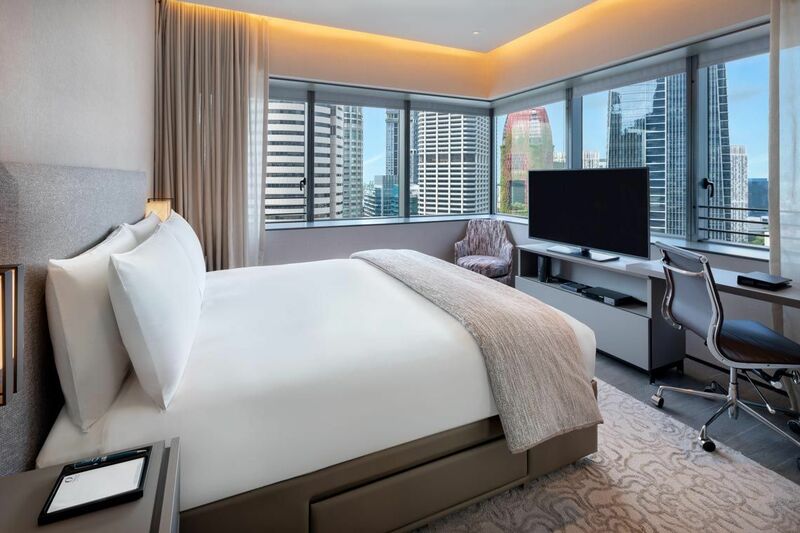 Wake up to a stunning harbor view in the comforts of Oakwood Premier OUE Singapore’s one-bedroom premier apartment, furnished comprehensively with high-quality furniture and fixtures. 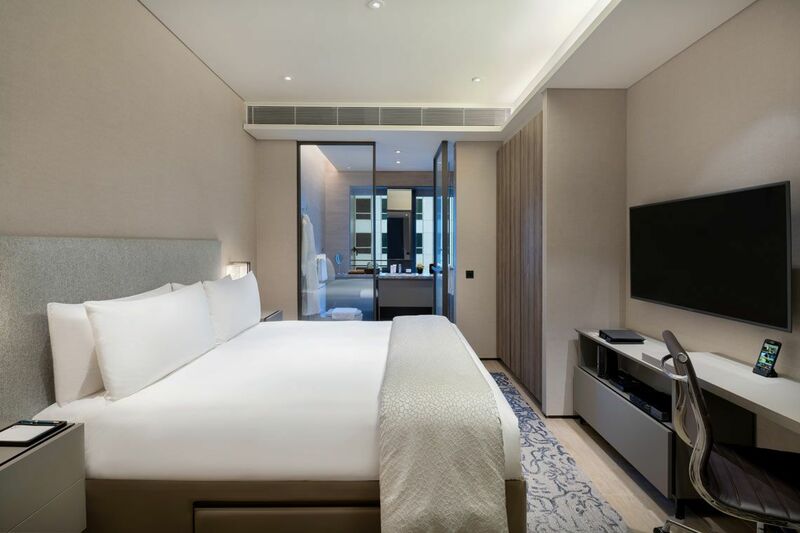 Guests can luxuriate in an exclusive residence of chic comfort and luxury, elegantly appointed with a fully equipped kitchen and premium amenities including a state-of-the-art Bluetooth sound system and Samsung mobile and tablet. 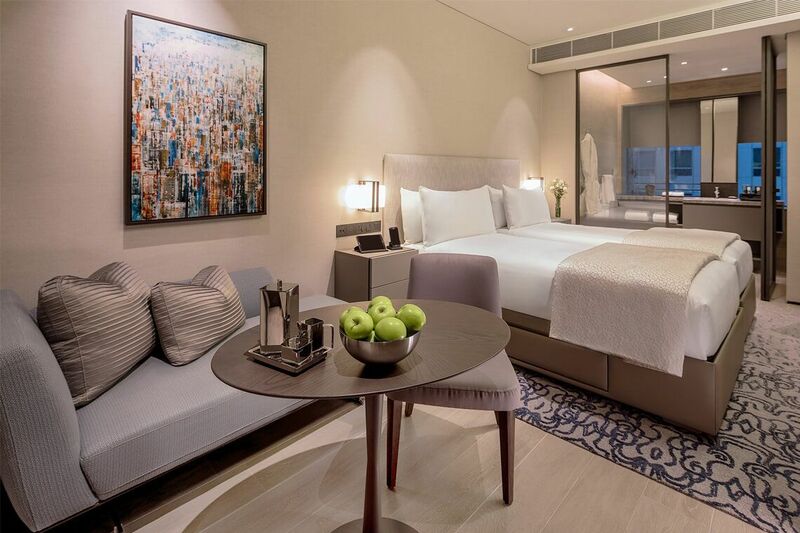 The two-bedroom deluxe apartment presents living with a design aesthetic that combines chic urban styles with a sophisticated color palette. Luxuriously furnished, each apartment comes with a fully equipped kitchen, along with a separate washer and dryer. 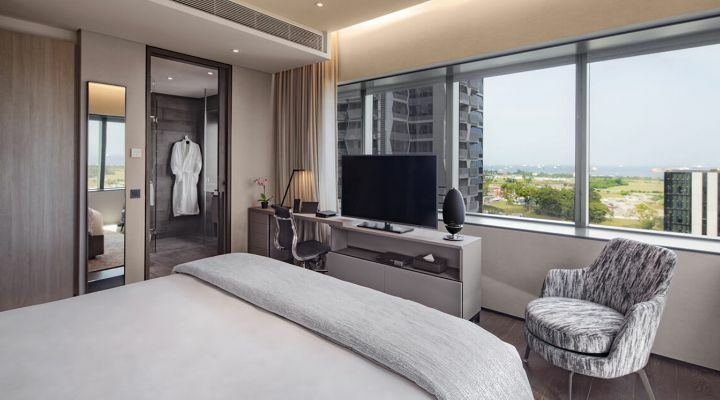 Guests are also provided with a Samsung mobile and tablet to use during their stay, and a Bluetooth sound system enabled within the apartment. 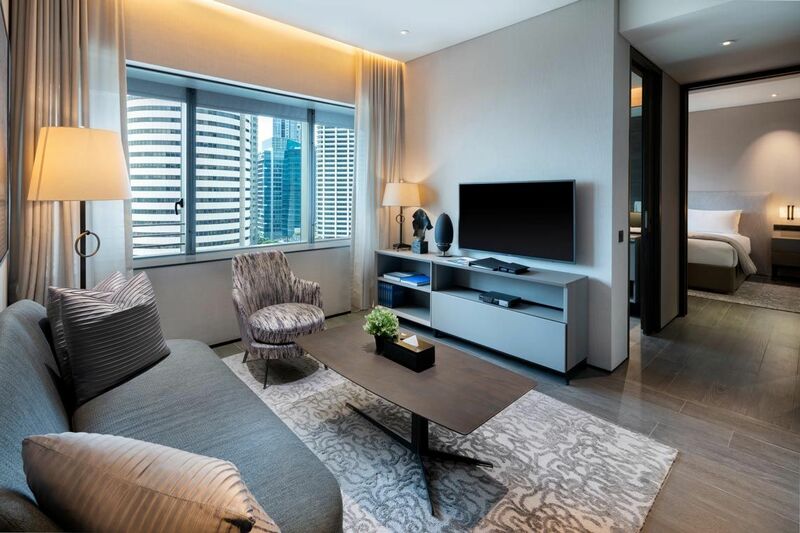 Bask in contemporary luxury in the midst of the bustling business district with the two-bedroom executive apartment. 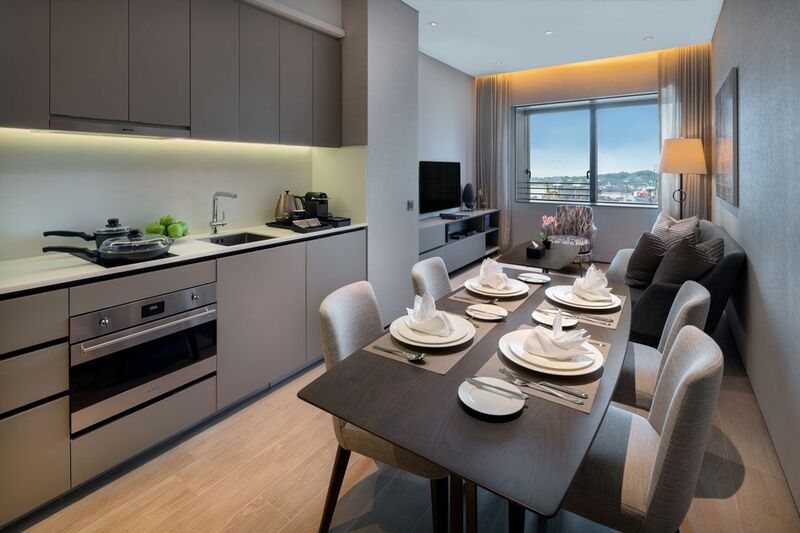 Stylishly fitted with modern décor, each apartment provides polished interiors and maximum comfort, including a built-in bathtub, a separate washer and dryer, a fully equipped kitchen and dining area. 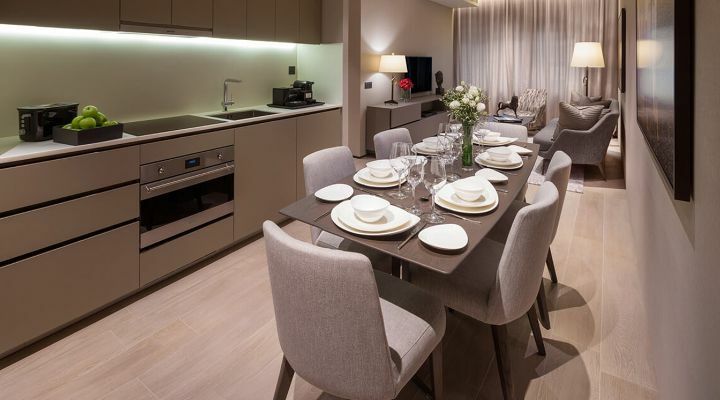 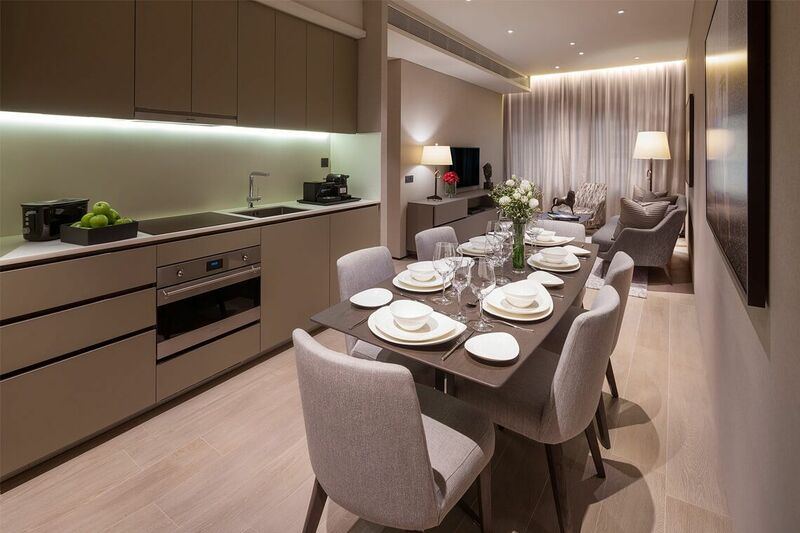 The two-bedroom premier apartment epitomizes luxe modern living. 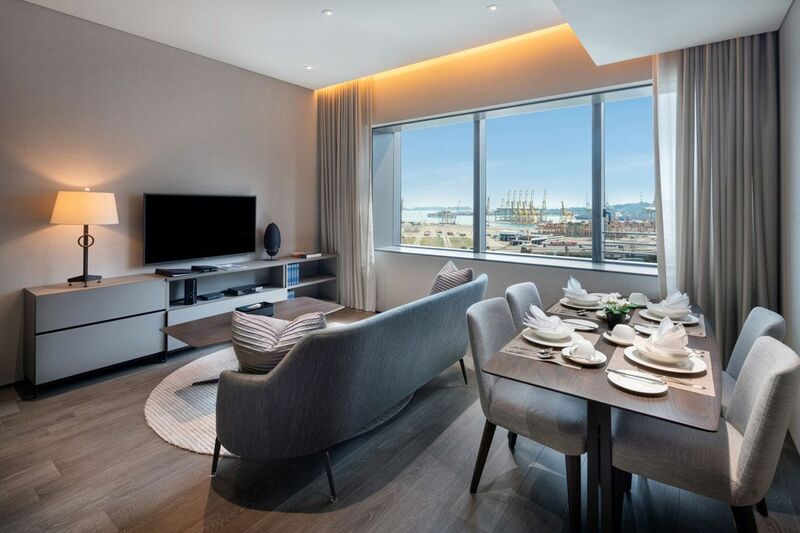 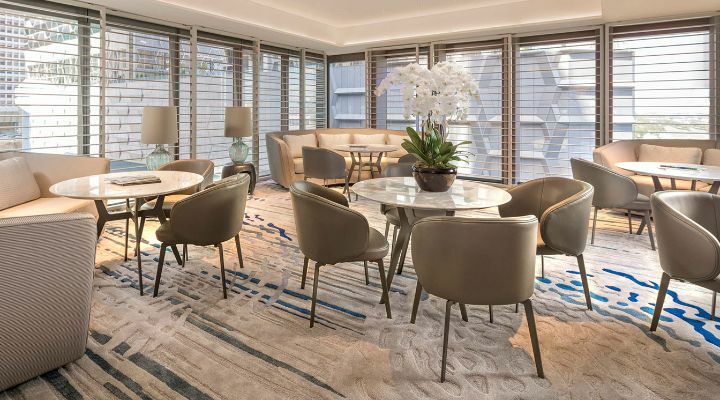 Each elegantly designed apartment offers a spacious living room, a private dining room with an adjoining fully equipped kitchen and rooms with spectacular views overlooking the city’s harbor. 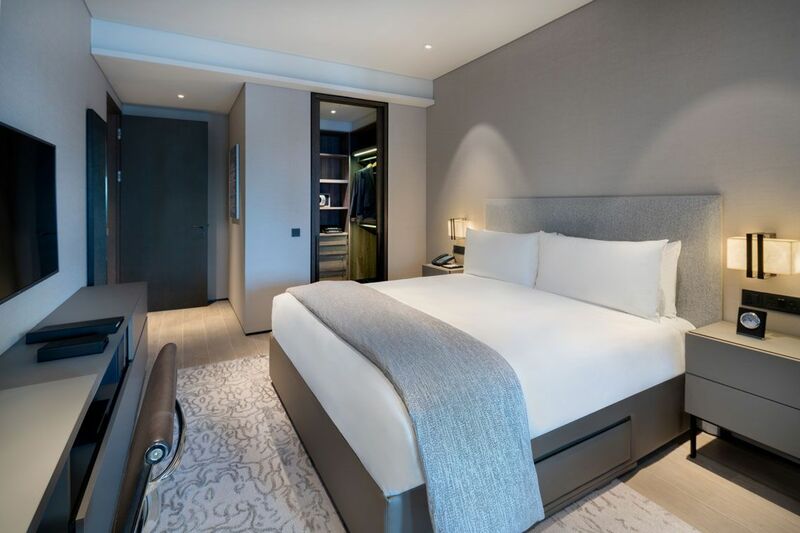 The sophisticated abode comes with a full range of amenities including a walk-in wardrobe, a separate washer and dryer and state-of-the-art Bluetooth sound system. 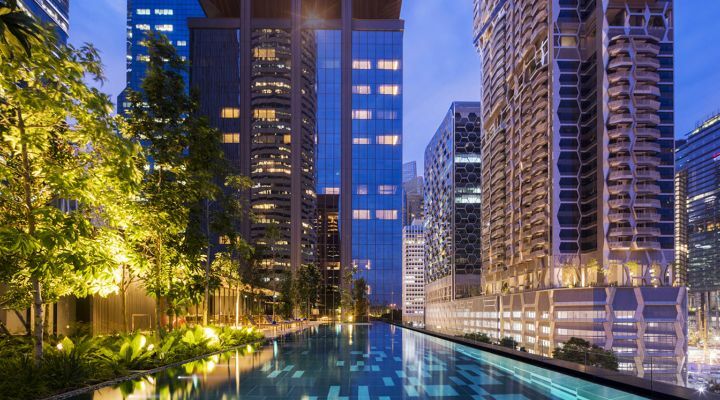 Overlooking the outdoor infinity pool and city skyline, the Club hosts both corporate and social events comfortably for up to 70 people. 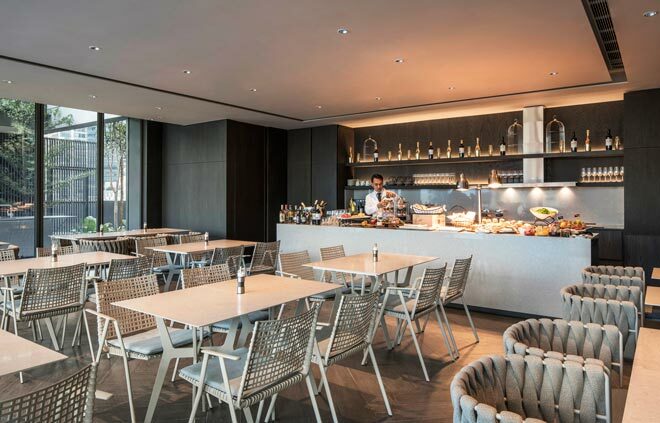 An al-fresco culinary-grade barbeque pit at the pool terrace is also available for bookings, including on-site chef services. 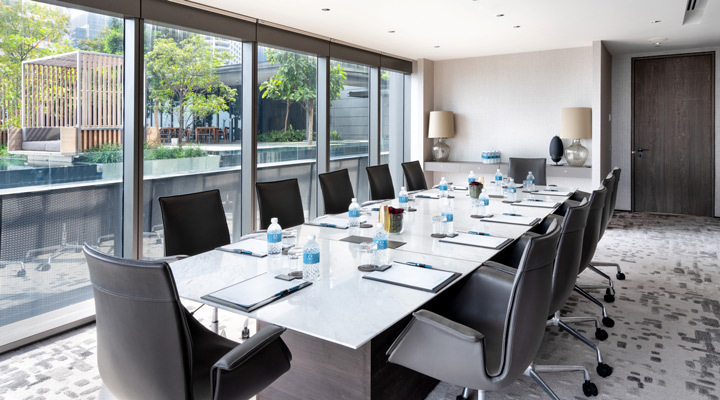 The downtown location makes the Executive Boardroom an optimum and convenient venue for intimate business meetings. 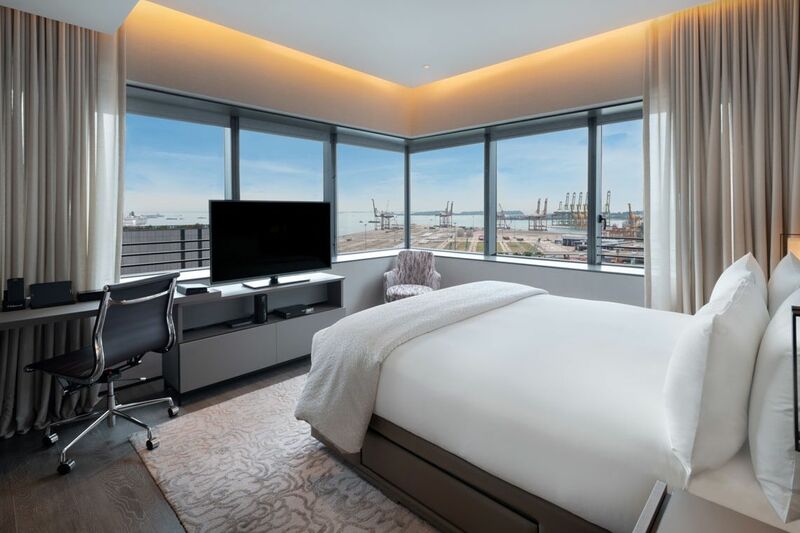 Floor-to-ceiling windows overlook the city’s iconic skyline and provide ample natural lighting for productive and engaging work sessions. 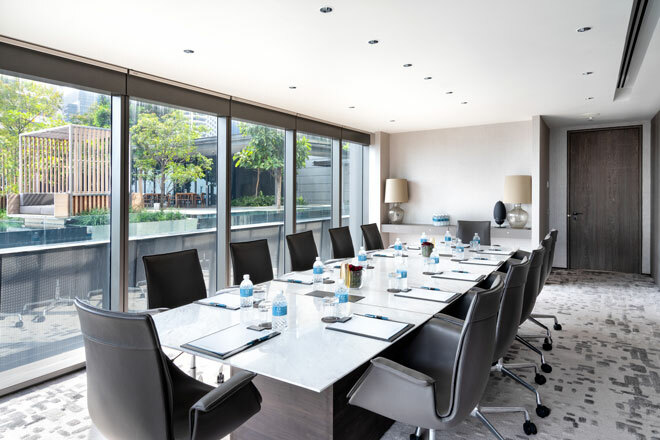 Catering for up to 12 persons comfortably, the Executive Boardroom provides state-of-the-art amenities, fast wireless internet, audio-visual equipment and a glass whiteboard for high-tech meeting requirements. 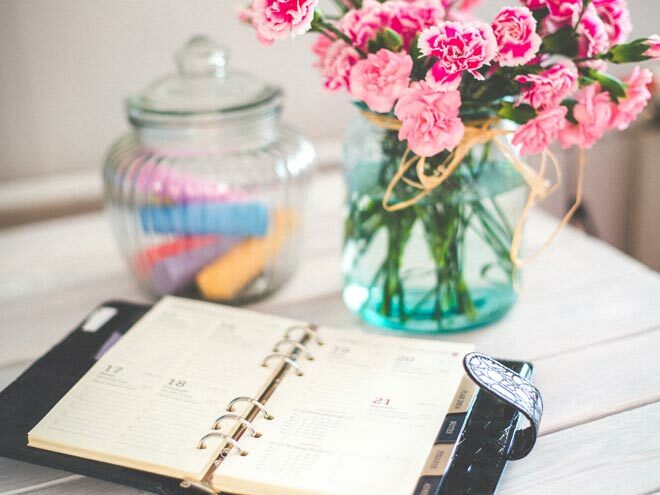 A comprehensive range of boardroom packages (coffee break, lunch, half and full day) are available for booking to cater for various functions. 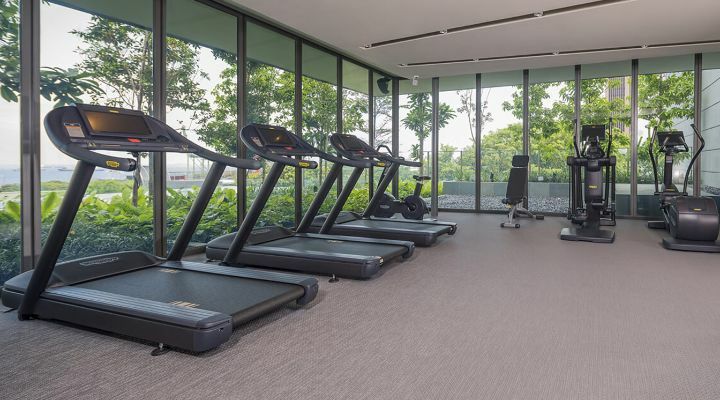 How to register: Visit aquaspin.sg/buy-classes/ to reserve slots. Oakwood Premier OUE Singapore guests enjoy a preferential rate of S$25+ per class. 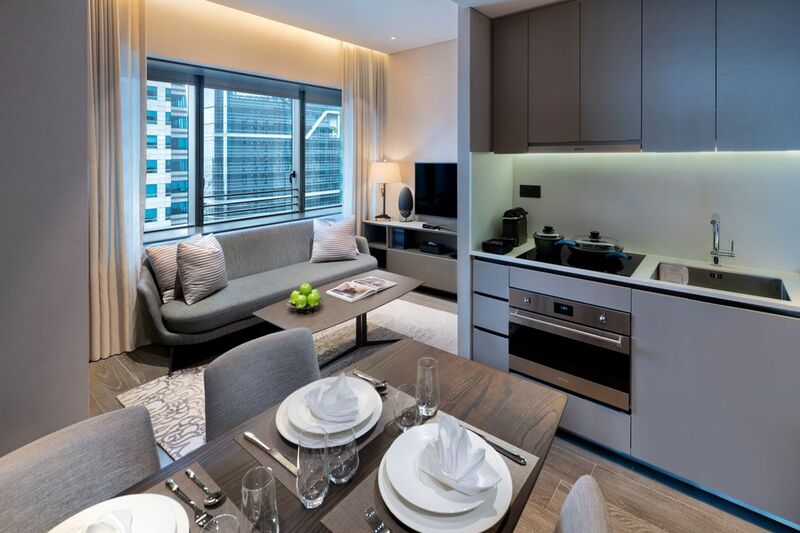 Helmed by Executive Chef Dickson Fung, Se7enth offers contemporary dining for breakfast, lunch and dinner. 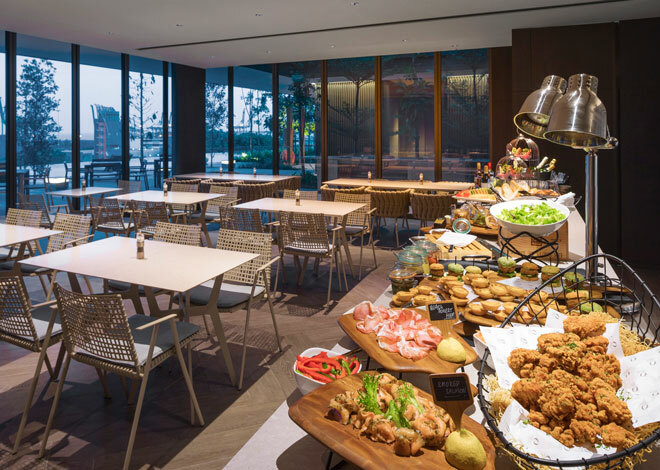 Vast presentations of sumptuous breakfast buffet spreads are laid out daily, while modern international cuisine are served for lunch and dinner. 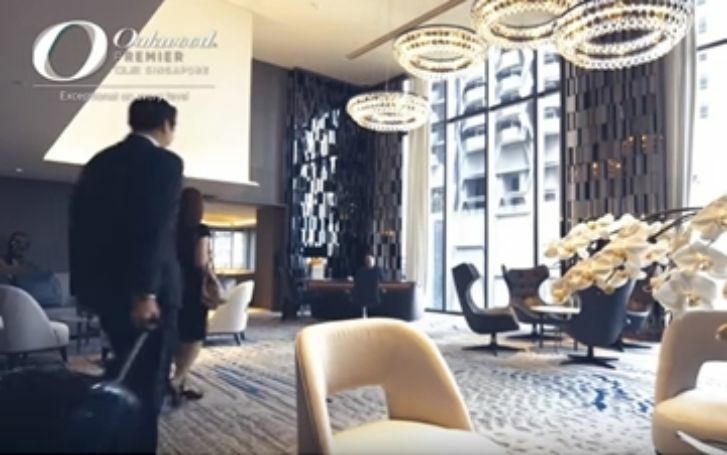 With a seating capacity of up to 74 persons, the space is also available to host large groups for social or business gatherings. 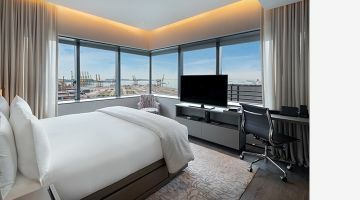 Culinary highlights include Australian Grain-Fed Rib-Eye Steak, Wagyu Beef Burger with Pan-Fried Foie Gras, Pan-Seared Salmon and Sirloin Beef Hor Fun. 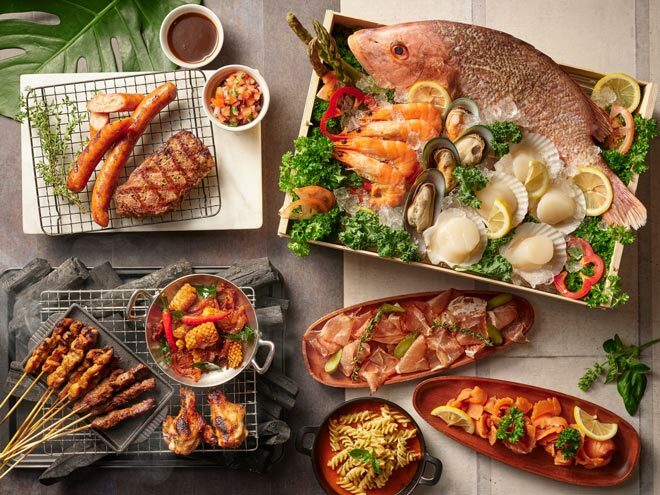 An extensive array of surf and turf delights and egg-citing desserts, complemented with unlimited house pours and juices. 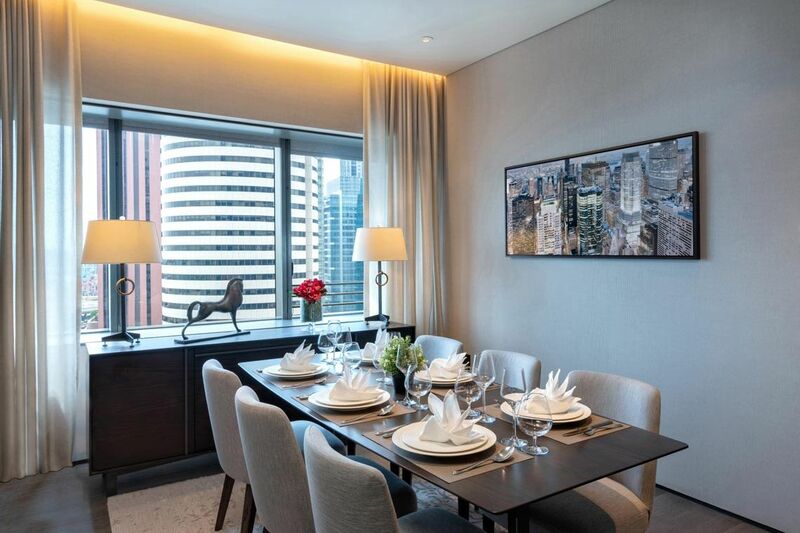 Show appreciation for your secretaries or administrative assistants with the Executive Semi-Buffet Lunch from SE7ENTH. 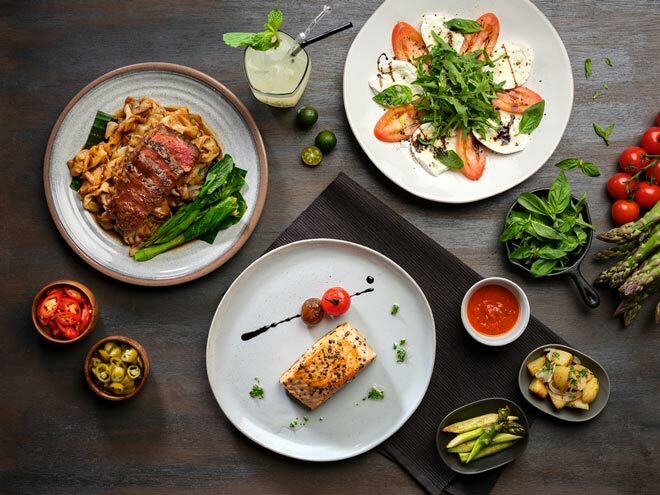 Enjoy a four-course set lunch featuring a fresh salad and appetizer bar as well as choice of mains, dessert and a premium coffee or tea. 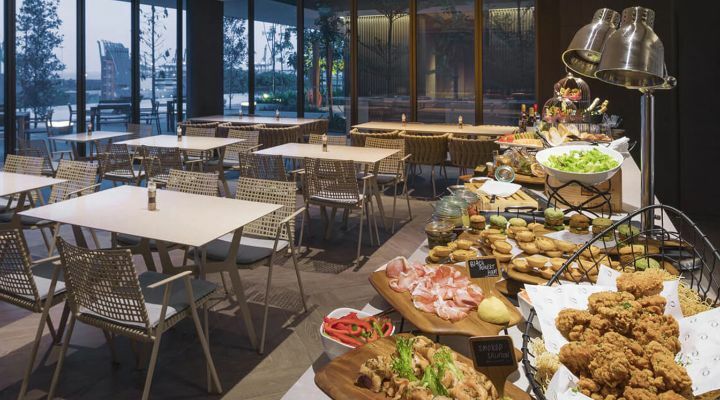 The weekday Executive Set Lunch menu introduces an exquisite and contemporary line-up of main courses as well as free-flow appetizers from SE7ENTH’s lavish customizable salad bar, featuring a variety of gourmet greens and condiments, freshly baked breads and soups of the day, and choice of one beverage from a fine selection of Nespresso coffee and Monogram tea. 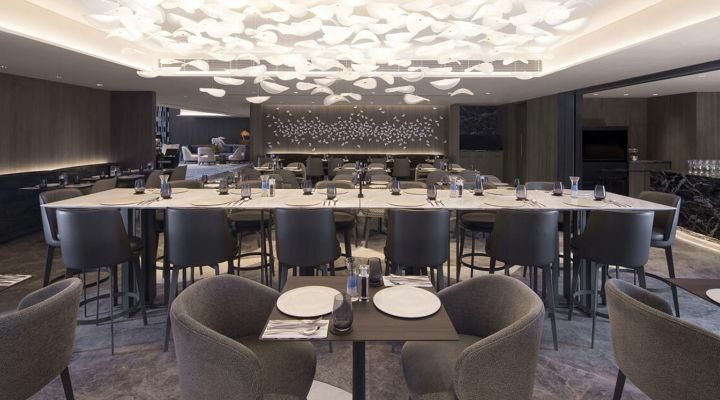 With main courses that change weekly, coupled with a convenient location, SE7ENTH is an ideal lunch spot to bring business associates and loved ones. 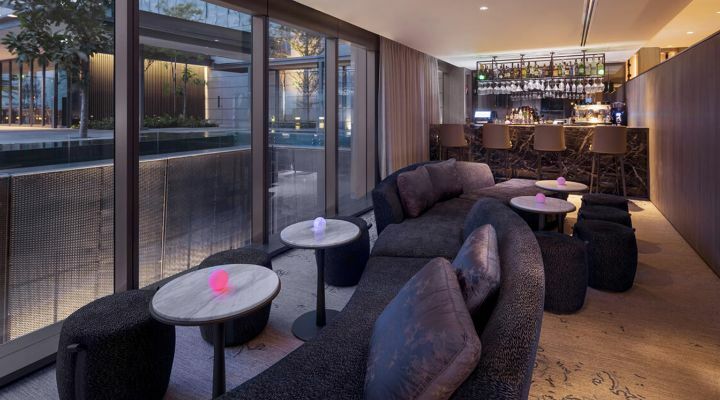 Hidden away from the madding crowd is The Bar; a chic, intimate lobby bar presenting a smart-casual social setting in the heart of Singapore’s downtown. 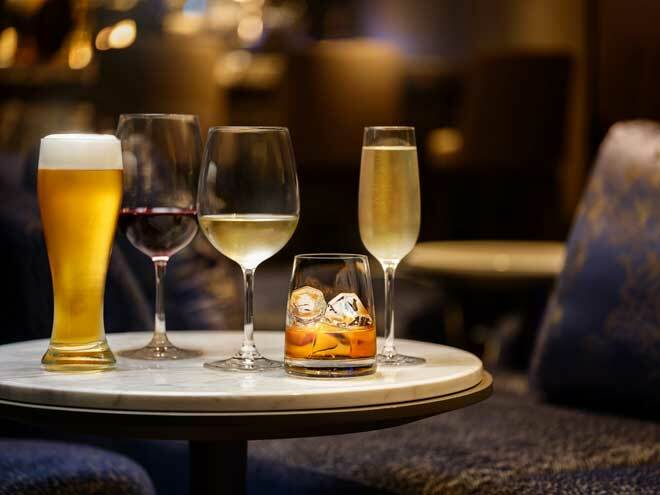 Offering a curated selection of cocktails, spirits and premium wines, as well as delicious bar bites, The Bar works seamlessly as an informal meeting point, aperitif spot or post-dinner night cap. 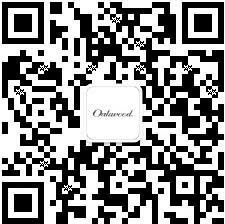 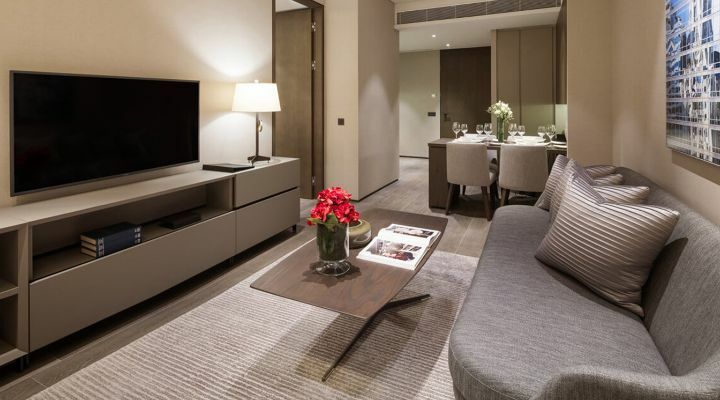 The Oakwood Executive Club is a first for serviced apartments in Singapore, epitomizing luxury living in the city. 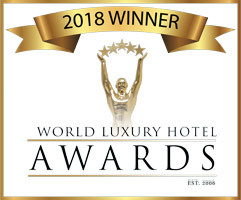 A sophisticated poolside environment, guests and members of the public may choose to indulge in al-fresco dining by the outdoor deck in the evening, relaxing in the sophisticated ambiance with a selection of delectable canapés and cocktails by SE7ENTH and The Bar.